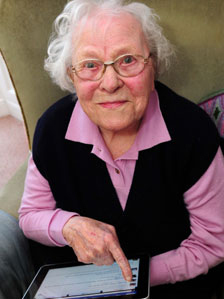 Lillian Lowe, 103, from Tenby, Pembrokeshire, has only a few dozen friends, mostly family, registered. But since being dubbed Facebook’s oldest user, she has had 999 friendship requests from around the world. Ms Lowe is thought to have become the oldest person among Facebook’s 500m users following the death of 104-year-old Ivy Bean, from Bradford, in July. The retired hotelier and businesswoman says she uses the site about twice a week to keep up to date with family, including two at university in Cardiff. She said: “I like it very much, to see my grandchildren and speak to them, but it does waste a lot of time.